. 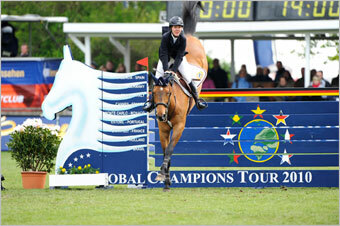 :: GLOBAL CHAMPIONS TOUR OF GERMANY, HAMBURG 2010 ::. 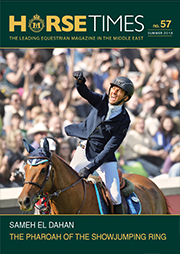 16,000 people watched American Lauren Hough who was last into the ring and ended up leading female rider one, two, and three in the Global Champions Tour Grand Prix of Germany. It is perhaps a bad sign for course builders when the first horse into the ring in a big class goes clear! However Frank Rothenberger did not need to worry too much as, although Hong Kong's Kenneth Chen did exactly that at the end of the first round - there were just ten completely clear rounds from 50 starters with the time being quite tight and possibly an issue than the actual course. Six went through to the second round with a single time penalty and pushing to make it might have resulted in mistakes being made by several combinations including the likes of World Champion Jos Lansink who had one down and a time penalty on Spender S. As well as the six on one penalty, there were then 10 completely clear and both Marcus Ehning and Jessica Kurten got through as fast four faulters. American Laura Kraut with Cedric was the first to go double clear which must have made up somewhat for Cedric's uncharacteristic stop in the second round in Valencia. But she was soon joined by another lady, Edwina Alexander on Cevo Itot du Chateau as a line involving the water and the combination took its toll of the field. It looked as if it would be an all female jump off until the last two riders also jumped a second clear round. Marco Kutscher went clear on Cash to keep the home fans happy and the last person to join the list was another American lady, Lauren Hough on Quick Study. In the timed round it seemed as if it was all going to be about time as Laura Kraut felled the second vertical on Cedric. Then Edwina made an amazing turn from the third to the fourth which put her seconds up on her predecessor, but Itot du Chateau slipped on the easier turn into the second last double and hit the first part. The Aussie lost her advantage then although was still a fraction faster in 38.43. Marco Kutcscher had no option but to go for it but Cash despite his ground eating stride was a little slower and then demolished the last vertical in 38.94. Which of course meant that last to go Lauren only had to leave the fences up to win. It was immediate and obvious that the American decided to go for a steadier clean round and her risky strategy paid off when Quick Study flew over the last oxer and stopped the clock in 42.46 but with all fences still intact.